Saspurrilla "Sassy" had been clinging to a teeny branch 40 feet up the trunk of a pine tree in a neighbor's back yard. You can just barely see her in the picture to the left. She spent two nights in sub-freezing temperatures, sleet, and snow before her owners found her. Sassy had ventured into the yard, and to her fright, four huskies came barreling out of the doggie door and chased her up the tree. Thankfully, the dogs' owners were kind enough to keep the dogs inside for the next two days hoping Sassy would make her way down. The second morning after Sassy's disappearance, her owners went door to door on their country road asking if anyone had seen her. Imagine their relief when they found someone who knew where Sassy was. Their relief was short lived when they saw her precarious perch! Once she was found, her owners called Animal Control who gave them my number. I got Sassy down 1/2 hour before the sun set on a third night that was forecast to drop into the single digits. That night she enjoyed a bowl of her favorite food and slept comfortably in her heated house instead of the 7-degree outdoors. The next morning, Sassy and her relieved owners sent the picture below. Sassy shows no lingering effects of her sub-freezing ordeal. 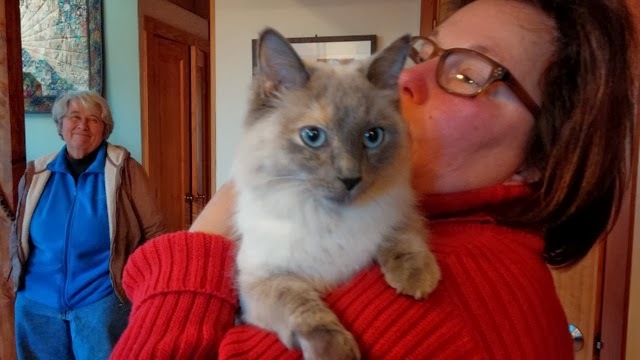 Thank you to Barbara and Wendy's friend, Zika, for the photo of blue-eyed, happy Sassy.